First Vice-president Lion Ruth McKee lead the meeting today and called on our young guest, Maeve to lead us in the flag salute, Lion Pat to lead us in song. Two sympathy cards were sent around for Lion Carol and Lion President Karen, each of there fathers had passed away and their services were held today. Lion Lauri announced that the September 21st meeting will be held at the Visalia Rescue Mission at 322 NE. Santa Fe here in Visalia. We will have lunch and be given a tour a tour of the facility. Lion Brad gave us all a message from golf committee chairman Lion Melinda, she wanted to thank all of us who worked on the golf tournament and made it so much fun and the success it was. Acting president Lion Ruth started off happy bucks with her “happy Friday” happy buck. Lion Brad was happy his son recently got a job in Bakersfield and will be within easy driving distance. Lion Arron was happy his wife Lion Betty, who recently broke her ankle, is now is now in a boot and out of the cast. We are all wishing her a speedy and complete recovery and hope to see her at club soon. Lion Steve was happy the golf tournament off so well and that his 8-year-old granddaughter was helping put out T-Signs. Lion Leigh was also happy for the success of the golf tournament. 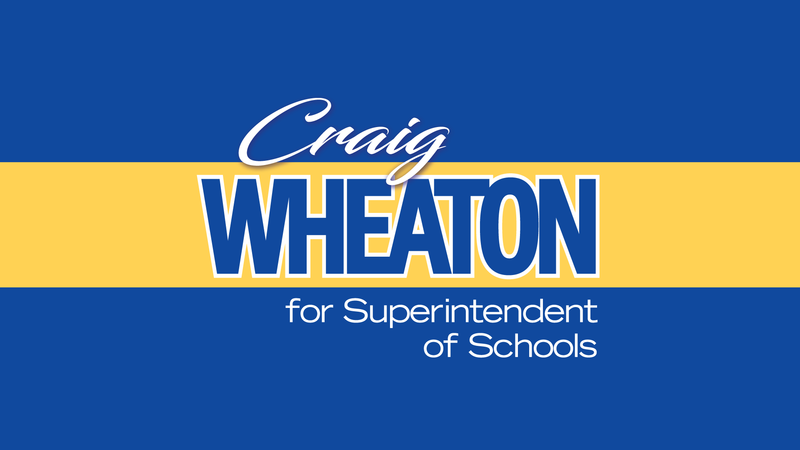 Lion Craig was happy to be sitting at a table and referee a political debate that he was not part of for a change and happy that school had started and happy he was going on an overnight backpacking trip before he started on the campaign trail this fall. Lion “Tommy” Link was happy that Angelica, the new Leo advisor at La Sierra school is 100% behind the program going forward. Lion Lauri was happy Lion Pat had given her the gift of two books, one of which was Roberts Rules of Order. Lion Vicki was happy for the golf tournament. Lion Brad fined Lion Bob Line for being on the last place team in the golf tournament. Lion Vicki was our secret greater and garnered $2 for the club because Lion Bob and Lion Tom Link didn’t shake her hand. 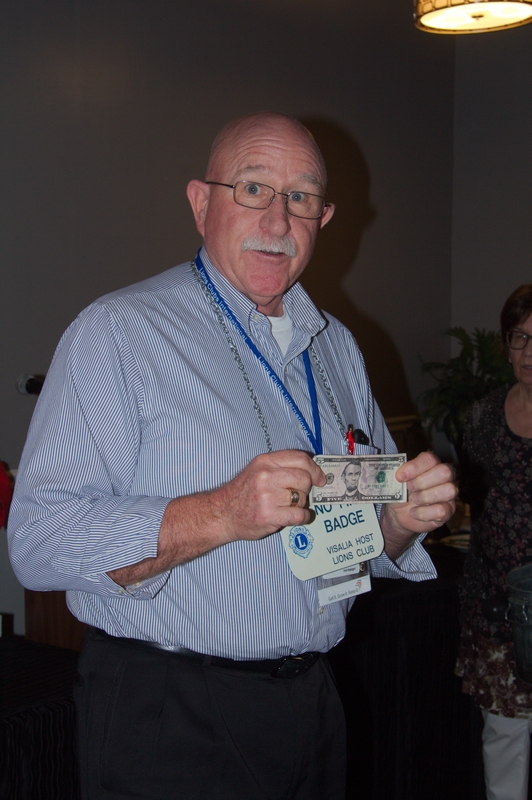 Lion Allen won the $5 and donated it to the Lions Eye Foundation. Rodney Blaco and his daughter Maeve were our program today. 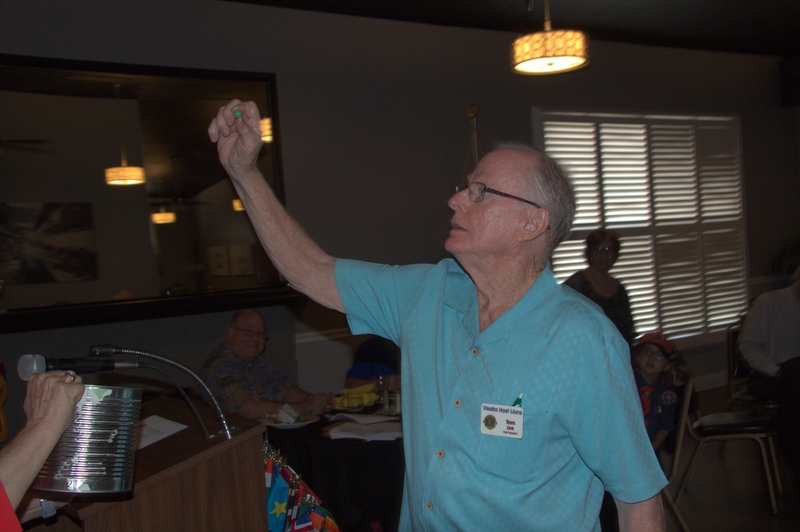 Rodney has been a speaker at our club several times speaking of various subjects from the DAs office, where he works to Kaweah Softball but today he was speaking on the first all-girls Boy Scout troupe in California. Maeve even lead us in the flag salute. Brad, who won the no fine badge, give a happy buck. 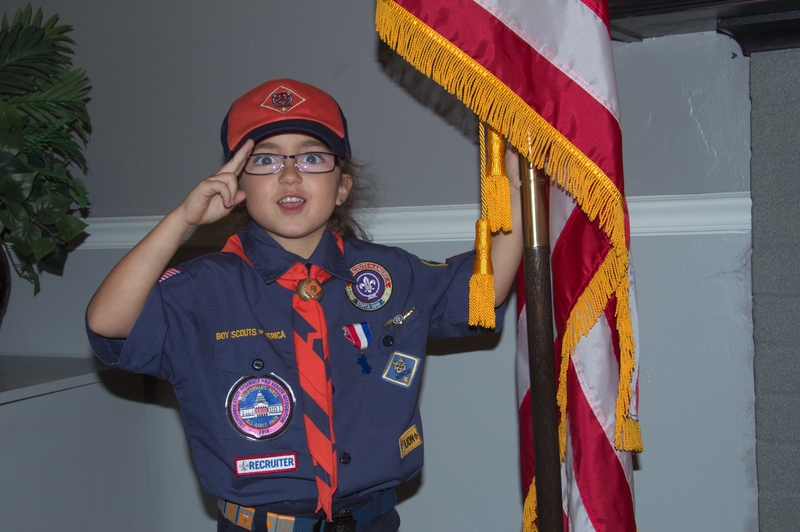 Maeve, who is a member of the first all-girls boy scout troupe in California, leads us in the flag salute. Lion “Tommy” Link draws for the white marble, but he got a green one.